Periodic multilayer coatings that operate near normal incidence can be deposited onto super-polished mirror substrates in order to construct, for example, a Cassegrain-type telescope comprising a large concave primary mirror and a small convex secondary mirror, as illustrated in the figure at right. In fact a number of solar physics satellite and sounding rocket instruments have used normal-incidence multilayer telescopes following this approach over the past two decades, including the SDO/AIA [ Lemen et al., Sol. Phys., 2011 ], Hi-C [ Cirtain et al., Nature, 2013 ], and GOES-R/SUVI [ Martínez-Galarce, et al., Opt. Eng., 2013 ] instruments shown in Figure 1 through Figure 4 below, all of which used narrow-band EUV multilayer coatings produced by RXO. Figure 1. 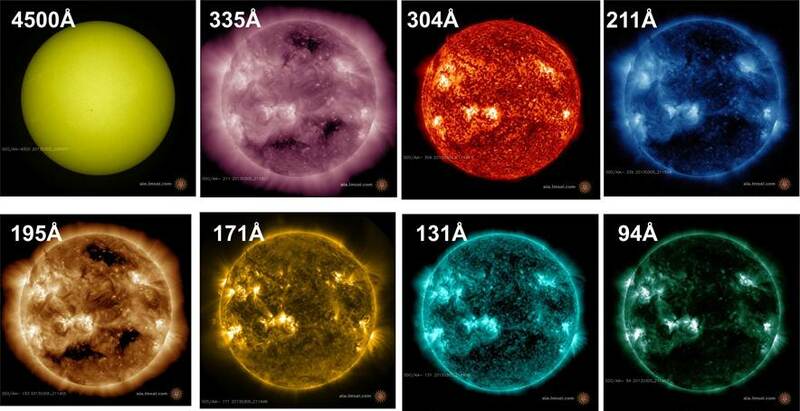 The AIA instrument on-board NASA's Solar Dynamics Observatory mission comprises four Cassegrain-type telescopes. Each telescope is divided into two imaging channels (selectable using a mechanical shutter); 7 of the 8 imaging channels use EUV multilayer coatings. RXO provided multilayers for four of AIA’s EUV imaging channels. Figure 2. Example full-disk images of the Sun, from SDO/AIA. Current high-resolution images can be found here. Figure 3. The Hi-C rocket instrument, whose optics were coated by RXO with graded-Γ Al/Zr multilayers tuned to λ=193 Å, achieved angular resolution that is ~5x greater than SDO/AIA. Figure 4. 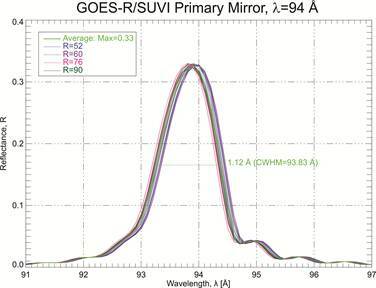 The telescope mirrors used in the GOES-R/SUVI instrument were each coated with six EUV multilayers, for monochromatic imaging from λ=93.9 Å to λ=304 Å. The six EUV multilayer coatings were deposited in separate, sequential coating runs using masked deposition. A primary and a secondary mirror are shown above during instrument development, after three multilayer coatings had been deposited on the primary, and after four coatings had been deposited on the secondary. Control of multilayer coating thickness over the surface of figured optics is often a critical consideration for optimal instrument performance. That is, the multilayer period usually must be precisely matched to the incidence angle everywhere on the mirror surface, in order to ensure that the entire surface reflects the same wavelength of light. (See, for example, Windt and Waskiewicz, JVST B, 1994.) RXO uses a variety of methods to control coating uniformity on figured optics. 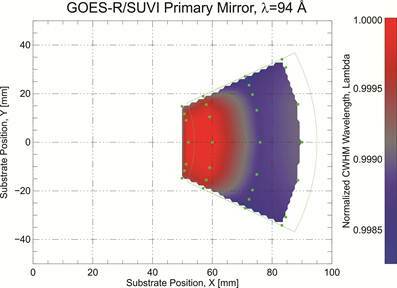 Normal-incidence EUV reflectance measurements are used to map coating uniformity, as illustrated in Figure 5. Figure 5. Left: Reflectance-vs-wavelength measurements made near normal incidence at the ALS [ Soufli, et al, SPIE, 8443 (2012) ] over a grid of points spanning the clear aperture of a GOES-R/SUVI primary mirror. Right: A contour map representing normalized coating thickness, using data derived from the measurements at left. The positions on the mirror surface where reflectance-vs-wavelength measurements were made are shown as green dots. Normal-incidence EUV multilayers designed for broad spectral response can also been produced, and they can be used for instruments such as grating spectrometers. For example, the Hinode/EIS instrument [ Culhane et al.,Sol. Phys., 2007 ], shown in Figure 6, uses gratings and mirrors coated with broad-band Si/Mo EUV multilayers for high-resolution solar spectroscopy. Figure 6. The Hinode/EIS instrument uses multilayer-coated gratings and mirrors to perform high-resolution EUV spectroscopy of the solar atmosphere.